A must-have for those suffering from dry skin! The combination of Almond Oil, Avocado Oil, Grape Seed Oil, Calendulated Olive Oil, and Wheat Germ Oil makes this a highly nutritious oil that feeds the skin and penetrates quickly. It has proven effective in treating Psoriasis, Eczema, and other dry skin conditions. It is for use in bath water (1 tsp to start), as a massage oil, or as an excellent moisturizer after bathing. Apply while the body is still damp & warm, then just let it soak in. You only need to use a small amount. 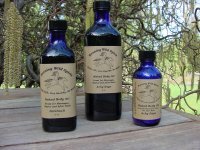 For those especially eager to avoid synthetic fragrances: most of our body oils are scented with only pure essential oils. Those with a fragrance (synthetic) oil scent are marked with an asterisk (*). We also offer an Unscented body oil, see below. Available in 1oz, 4oz and 8oz sizes.